Doctor of Science (D.Sc. )- Petroleum Engineering. Walter P. Drake, Director of Blue Marble University, stated: “We were looking to develop a new, innovative, multi-disciplinary chemical engineering doctoral program. With the newly developing hydrofracturing techniques as well as the discovery over the last 3 years of the immense shale oil fields Eagle Ford and Bakkan in the US, it was natural to focus chemical engineering education in the direction of petroleum engineering. That is where the jobs and opportunities are. Along with core engineering, we include many topics never found in a chemical engineering program but which are nonetheless very useful in the real world, and in real world careers, including: The Eagle Ford and Bakkan oil and gas formations; royalties and leases; business of oil; permits and environmental impact; industry sources of technical information; and the review of petroleum trade journals and research reports. With the DSc petroleum engineering degree from Blue Marble, you are more likely to end up in an office rather than on a drilling rig, although field work and field analysis is always going to be necessary”. Online Portfolio: Every student must complete an Online Portfolio, essentially an online published resume, summarizing their education, work experience, training, and interests. This course will outline the requirements which are intended to be met before completion of the program, and will introduce the student to the wordpress.com platform. Hydrocarbons: Properties of hydrocarbons, such as, density, refractive index, acoustic impedance, electrical conductivity and other. Engineering Mathematics: Math with emphasis on equations and formulas particular to the oil industry. Drilling Engineering: The art and science of drilling oil wells, including oil field familiarization, pressure control, and methodology. New Technologies: With reference to scientific journals, we explore various new technologies, methodologies, and management challenges. Shale Oil and the Eagle Ford and Bakkan Fields: A study of the recent and still rapidly developing discovery of the USA and Canada shale oil fields and recovery techniques. Subsea Engineering: Drilling underwater and spill prevention and containment. Horizontal Drilling and Fracking: The title says it all, we review and study the latest fracking technology. Storage and Transport: including 3 phase fluid transport, with emphasis on pipeline transport. Permit Processes and Regulation: Within what sphere of regulation does oil and gas production exist. Insurance law is also covered. Petroleum Economics: Evaluation of oil and gas properties, including the determination of producible oil and gas, as well as the determination of future value. Admission Requirements: Applicants must have a Bachelors Degree or higher in engineering, mathematics, or similar subject matter demonstrating previous engineering education. In special cases, a bachelors degree in an unrelated field with significant training or experience in oil and gas engineering, production, transport, or refinement will be considered as meeting the educational requirement. Tuition Cost: As with all programs at Blue Marble University, tuition is currently $2950 USD with payment plan, or $2550 annually if paid in advance. Tuition is subject to change from time to time. 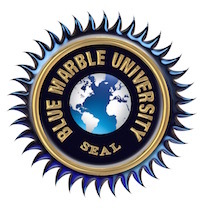 Please visit Blue Marble University for more information on this and other programs, as well as general application procedures, cut-off dates for this program, and more.